It's like magic: everything you watch on this 53"" projection monitor looks fabulous. Broadcast sports, concerts, or specials? The SD-533HD5 delivers a stunning high-definition picture (when combined with an HDTV tuner). Even regular TV will amaze you, thanks to an Automatic Format Converter, which up-converts standard interlaced signals to progressive images, nearly doubling the resolution. Movies on DVD or videotape? Its Reference Theater Mode automatically adjusts key settings (for example, color temperature) for the most film-like reproduction possible. It further enhances movie viewing with PureCinema, a Pioneer technology that recognizes film-based sources and recreates each individual still frame, for a more authentic movie presentation. Also included are a high-end set of connections and a glow-in-the-dark smart remote. I bought this tv around 13 or more years ago, and it's still going strong!!! Excellent picture. User friendly. Allows you to put items on top of TV. Easy to move around(rollers). Parts/Service could be problem as Pioneer no longer manufactures this type of TV. Again, I find that the reviewers of this product are correct. This television is so good that I look forward to watching it every day. poor product and even worse customer care and satisfaction! DO NOT, I repeat, DO NOT buy this product. after buying what was suppose to be a quality product and after having this product for not even 6 months it went south on me, the color red shifted to the top of the screen then blew the power, I couldn't turn it on anymore. a repairman came out to my house and did a patchup on this television, it lasted maybe 2 hours then the same thing happened again. now a call the Pioneers customer care tells me that the parts are on order to fix it but they can't find the parts anywhere, so i sit here for a week and a half now with no tv after spending big dollars on a supposed quailty product to find i have to sit here even longer yet for them to find then parts, then on top of it he tells me it will be at least another week in shipping when they do find the parts, i guess a "quality????" company such as Pioneer has yet to hear of overnight shipping or any kind of customer satisfaction! this is one customer that will never buy another Pioneer product ever again. I should of gone with the Toshiba!!! If you're looking for an unbelievable rear projection HDTV let me tell to look no further. I previously had a Hitachi that died after only 7 months service. I then found that the larger Wal-Mart stores have this model in stock. If you can't find it in a store near you, it's available at Walmart.com for $1868 plus $98 delivery including unpacking and placing it in your home. There was a $200 price cut just in the last week at the store. 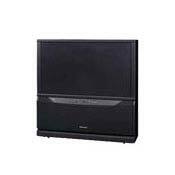 Pioneer is known for outstanding projection tv's. As for the picture--it's unreal...like looking at a postcard even with my standard cable signal. With my progressive dvd player and monster component cables, my jaw drops and I still find it hard to believe how spectacular the picture is. It was almost perfect straight out of the box except for a little dark and constrast all the way up. There are five stretch modes for watching 4:3 pictures so you don't have to worry about burn-in and the cinema wide mode doesn't look distored at all. I haven't had it a week yet, but I'll let you know how I progress later. First off I have not bought one yet. But I want to say that alot of these reviews say "There is no difference between the ELITE and the regular Pioneer" That is Horsepucky. First of the Elite series is on PureCinema II and III. While this years Pioneer HDTVS use PureCinema I. That is not a bad thing because PCI is still better than most of the products out there today. Secondly the Elites use a a .52 dot pitch in thier screens. The vanilla pioneer uses a .72 line pitch. This does make a big difference. The picture will be much clearer and artifacts less visible. So basically, Elite is Pioneer cutting edge, and Pioneer is old elite tech. Oh yeah and no urishi finish. I just did not want everyone to be mislead. By far the best HD RPTV for the money. The natural wide feature is the best in the business. light-up remote, removable screen saver, d-sub input, center channel in. This is the set of all sets, piano cabinet insane black levels, strong color, gold inputs. If you want to stop comparing tvs and buy the best - buy this one, you'll save a lot of time. Picture clarity. Color tones, particularly skin tones. It is kind of a challenge to take down a narrow stair case, and I have to buy more beer because my neighbors are wanting to watch the Packers on it too. I've had the set for nearly a year. By this time I've usually experienced at least three to five episoids of buyer's remorse. However, with this product - not one, it continues to delight me. No longer do I long to sit in the cold bleachers of a Packer game- I'll take my chair in front of this set any day! For $2000-2500 this is the best money can buy. Let me rate it on the scale 0-10: picture quality - 9, video modes - 10 ("cinema" is as close to real life as it gets), deinterlacer - 10 (better then Faroudja, I can prove it), convergence - 9 (72 points! ), features - 7. You don't need progressive DVD - internal deinterlacer is a champ!